A lot can change in four years, and in the case of the U.S. natural gas industry, a lot of things have changed for the better since 2013. This is evidenced by a new American Petroleum Institute (API) study released this week that finds U.S. liquefied natural gas (LNG) exports could support more than 450,000 additional American jobs and add as much as $73 billion to the U.S. economy by 2040 — all while having a minimal impact on domestic natural gas prices. This most recent API LNG study, conducted by ICF International, is even more optimistic about the future of U.S. LNG exports than a similar API/ICF report released four years ago. This is largely because upstream technological advances have helped natural gas development become more efficient and price-responsive since that previous report. America’s natural gas resource base is also significantly larger than it was back in 2013 — jumping from 3,550 trillion cubic feet (tcf) to nearly 3,700 tcf, according to the report. The report forecasts the global market for LNG increasing to 32 trillion cubic feet (tcf) by 2040, a 45 percent increase from the forecast of 22 tcf ICF’s 2013 report found. This projected global demand growth is in line with recent forecasts by the International Energy Agency (EIA), U.S. Energy Information Administration (EIA) and Bloomberg New Energy Finance’s (BNEF) Global LNG Outlook 2017, all of which predict LNG demand will rise due to its abundant supply and climate benefits over other fossil fuels. 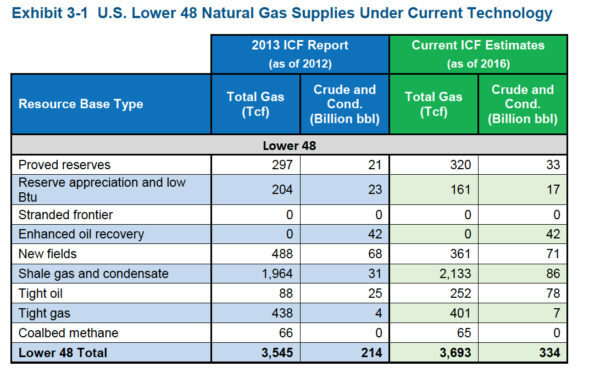 Similarly, ICF’s forecast of America’s potential 2040 LNG global market share jumped from 8 to 24 billion cubic feet per day (bcfd) in this new report, compared to the 4 to 16 bcfd per day forecasted in 2013. Based on the most recent updates on various domestic LNG liquefaction/export facility construction projects, the continental U.S. could see its current LNG exporting capacity more than triple by this time next year. Sempra-Cameron LNG’s Hackberry, La., facility; Cheniere’s Corpus Christi, Tex., facility; Kinder Morgan’s Elba Island, Ga., facility; and Freeport LNG’s Texas facility are all under construction and could be in operation by the end of next year. Cheniere is also expected to open train five of its Sabine Pass location in the third quarter of 2019. Collectively, this could bring the U.S.’s total LNG exporting capacity from 2.1 billion cubic feet per day (bcfd) to 11 bcfd in just two years, according to the EIA. A pair of Charles, La., facilities (Lake Charles LNG, Magnolia LNG) have received Federal Energy Regulatory Commission (FERC) approval, as have Cameron LNG’s planned Hackberry, La., facility and ExxonMobil’s planned Texas facility. These projects could all be in operation by 2023, while numerous notable proposed facilities, such as Oregon’s Jordan Cove, have filed for filed for FERC approval as well. 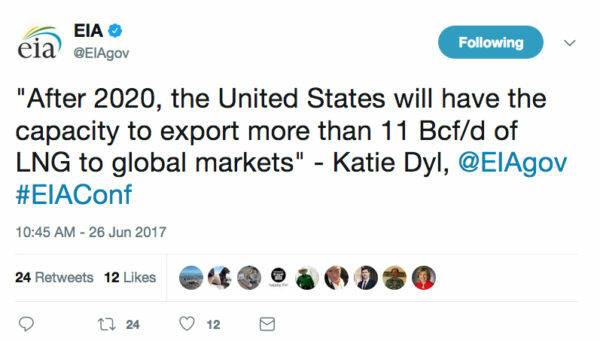 Considering the progress of all these projects and the findings of this API report, it’s no wonder experts believe the U.S. will be the world’s third largest LNG exporter by 2020 and possibly the world’s top LNG exporter by 2022. This is an incredible development, considering it was less than two years ago that the first ever shipment of LNG from the continental U.S. was shipped out of Sabine Pass. The U.S. has already shipped LNG to 26 countries in just 19 months.